Last night, the moon was close to the planet Saturn on the sky’s dome. Tonight, the moon will pair up with Spica, the constellation Virgo’s brightest star. Our chart shows the eastern sky for fairly late tonight, around 10:00 p.m. That is when the waning gibbous moon and the star Spica will be low in the sky, below the planet Saturn. The moon and Spica will travel westward across the sky throughout the night. They’ll be at their highest in the southern sky in the wee hours after midnight. 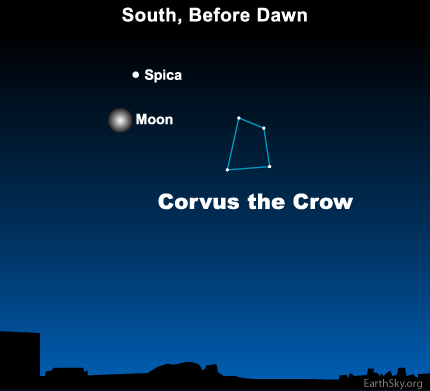 By the time dawn breaks, the moon and Spica will be low in your southwest sky. Tonight you can easily identify Spica, the brightest star in the constellation Virgo, because it is near the moon. However, the moon is close to Spica for only a day or two out of the month. On other nights, different telltale signs let you know that you are looking at Virgo’s brightest star. 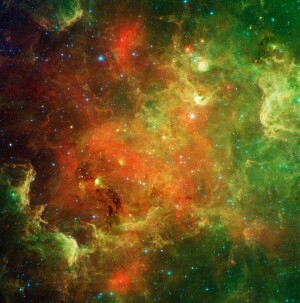 First, look at the small but easy-to-recognize four-sided group of stars in the constellation Corvus. The top two stars faithfully point to Spica. There is another way to find Spica. Follow the arc of the Big Dipper handle to the brilliant yellow-orange star Arcturus, then go twice that distance to land on Spica, a sparkling blue-white gem of a star! Site contents copyright © 2019 Recorder Online	except as noted. All rights reserved. | 88 queries in 2.337 seconds.